Get notified. Send an email to chadkister@gmail.com with "Get Arctic Refuge updates" in the subject line to get notified about Arctic National Wildlife Refuge updates. Your email will not be given out for any commercial uses. This is a moving, powerful film about the need to protect the Arctic National Wildlife Refuge to protect the Porcupine Caribou Herd that is the source of life for the Gwich'in and Inupiat peoples, some of the last First Nations cultures on earth still living principally off the land. It is mostly in the words of the Gwich'in and Inupiat peoples, and has amazing wildlife footage. goods and services provided by Arctic Refuge Defense Campaign. You can Now order an autographed copy of Arctic Melting: How Climate Change is Destroying One of the World's Largest Wilderness Areas by Chad Kister. Arctic Melting shows with powerful science how climate change is wreaking havoc on the Arctic, with retreating glaciers, melting permafrost, millions of acres of forest dead and coasts crumbling into the increasingly violent sea. But instead of just leaving it at the problem, Arctic Melting shows how we can meet all of the world's energy needs through efficiency, wind and solar energy. $12.95 plus $4.00 shipping. 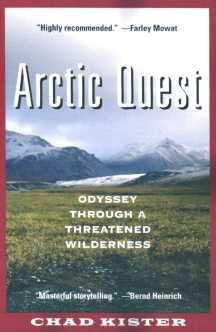 Arctic Quest is now out on audio in an 11 CD set read by Author Chad Kister. $20.95 plus $4.00 shipping. On sale now. Read about an amazing 700 mile adventure by foot and raft through the heart of the Arctic National Wildlife Refuge, and learn why it must be protected from oil development. $15.00 plus $4.00 shipping and handling (retail price is $17.95). Copies ordered here will be autographed. Send an email to chad@arcticrefuge.org within 12 hours of sending in your order if you want a personalized autograph. Twenty-five percent of the proceeds of the book received by the author will be donated to the Arctic Refuge Defense Campaign. Buy the Arctic Quest companion CD with hundreds of photos, maps and the latest information about the Arctic National Wildlife Refuge. The CD includes detailed maps of the entire refuge -- hundreds of maps in all. You can follow Kister's journey easily with the maps, and use them for your own expedition. This gives a much greater dimension into the epic story. Twenty five percent of the purchase price goes to the Arctic Refuge Defense Campaign. $7.00 plus $2 shipping and handling. Goods and services provided by Arctic Refuge Defense Campaign (OH, USA ).